Peers, we’ll be hearing a lot more from the nations in the Non-Aligned Movement (NAM) from now on. Can this not be seen as a positive development? The Helsinki Conference convenes next month. Date to be announced. Armageddon appears to be approaching climax. Is it possible to make a distinction between the good guys and the bad guys? Let’s focus on the issues and participate in the International Debate. I’ve done some highlighting in the article pasted below. Does everybody see the irony in this situation? Yet the New York Times, which has been beating the drums for war with Iran, just as it played a disgraceful role in the deceptive reporting during the lead-up to the Iraq War, never mentioned Iran’s proposal for nuclear abolition. The Times carried the bland headline on its front page, “At Summit Meeting, Iran Has a Message for the World”, and then went on to state, “the message is clear. As Iran plays host to the biggest international conference …it wants to tell its side of the long standoff with the Western powers which are increasingly convinced that Tehran is pursuing nuclear weapons”, without ever reporting Iran’s offer to support the NAM proposal for the abolition of nuclear weapons by 2025. Surely the most sensible way to deal with Iran’s nascent nuclear weapons capacity is to call all the nations to the table to negotiate a treaty to ban the bomb. That would mean abolishing the 20,000 nuclear bombs on the planet—in the US, UK, Russia, China, France, India, Pakistan, North Korea and Israel—with 19,000 of them in the US and Russia. In order to get Russia and China to the table, the US will also have to give up its dreams of dominating the earth with missile “defenses” which, driven by corrupt military contractors and a corporate- owned Congress, are currently being planted and based in provocative rings around Russia and China. The ball is in the U.S. court to make good faith efforts for nuclear abolition. That would be the only principled way to deal with fears of nuclear proliferation. The US must start with a genuine offer for negotiations to finally ban the bomb in all countries, including a freeze on further missile development. It should stop beating up on Iran and North Korea while it hypocritically continues to improve and expand the US arsenal, with tens of billions of dollars for new weapons laboratories and bomb delivery systems, and fails failing to speak out against the nuclear activities of other nations such as the enrichment of uranium in Japan and Brazil and the nuclear arsenal of Israel. Tags: international debate, Non-Aligned Movement, nuclear weapons. Filed under Israel and Palestine, israel and palestine articles, israel and palestine conflict by Father Dave on Nov 13th, 2012. Comment. Jewish Community in the UK attempts to silence Church of England Vicar! Father Roy writes: Armageddon is suddenly being waged on numerous fronts simultaneously. And a badly-needed international debate has been precipitated locally, in the UK. The post pasted below will explain. Let those of us who have eyes… see. Please study the website of the Rev’d Dr. Stephen Sizer. Stephen has allies in the USA: Challenging Christian Zionism and Apocalyptic Rapture Teachings. Let’s familiarize ourselves with the theological mindset of Christian Zionists: Jesus Camp ”Highlights” (10:38). Let’s make time for some serious Christian theological education, for “Theology” is the “Study of God”. Jewish groups in the UK have targeted Stephen in a test case of sorts. They claim that they can no longer afford to remain “quiet”. Well, we Christians can no longer afford to remain silent. Christians who live in the Holy Land are Palestinians. Christians and Muslims suffer together under Israel’s occupation. It will be interesting to observe what action Stephen’s Bishop — the Rt. Rev’d Christopher Hill, the Bishop of Guildford — decides to take in this matter. It will be interesting to follow subsequent developments in the Church of England, as well. Please read on. The complaint must first be considered by Bishop Christopher Hill, the Bishop of Guildford, as Revd Sizer’s church in Virginia Water, Surrey, comes under his jurisdiction. 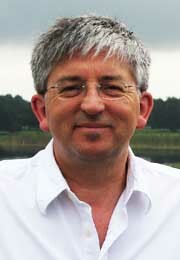 Revd Stephen Sizer is the Vicar of Christ Church in Virginia Water, Surrey. He is now the subject of a complaint by the Board of Deputies to the Church of England, for making statements that the Board and most of the Jewish community find utterly offensive, to the point of crossing the line into antisemitism, even if this is neither his motivation nor intention. This is not all, as we also complain of Revd Sizer posting links from his website to articles on racist and antisemitic websites where scurrilous views against Jews and others are published. When this happens, the Jewish community has to act. Under Church law the Board’s complaint has to be brought under an Act of Parliament, the Clergy Discipline Measure 2003. The complaint is therefore for misconduct consisting of “conduct unbecoming or inappropriate to the office and work of a clerk in Holy Orders”. Thankfully for relations between British Jews and Christians, Revd Sizer is very much the exception.He displays an obsession with Israel and opposes its identity as a Jewish state. The Jewish people’s belief in national self-determination, or Zionism, is shared with most of the world’s nations – but Revd Sizer displays a deep hostility to Zionism, which he writes about as if it was a term of abuse. It is not difficult to come across his views, as he is an enthusiastic self-publicist who proclaims his preoccupation with Israel on his website, blog, Facebook and flickr pages. We need to be clear about what it is we complain of. We make no complaint about Rev Sizer’s anti-Israel views, nor of his trips to Iran or his supersessionist theology. While we view all of these with concern and distaste, Revd Sizer is entitled to his views and may travel where he wants. But we draw the line at making statements that we regard as antisemitic and advertising the content of racist and antisemitic websites. It is a matter of great regret that we are driven to make this complaint, but the Jewish community should not have to stomach material that we see as crossing the line into antisemitism. To anyone who asks what it is that we seek from the complaint, my answer is simple. If it is upheld, it will be a matter for the Church of England what action to take to address Revd Sizer’s conduct. But I can say that we are not seeking to have him stopped from his ministry or dismissed from his job. We only ask one thing, which is that effective measures are taken to prevent him from publishing or re-publishing material that we find to be not merely offensive, but antisemitic. We don’t think that’s too much to ask. Tags: holy land, international debate, jewish board of deputies, stephen sizer. Filed under Israel and Palestine, israel and palestine articles, israel and palestine conflict, israel and palestine religious conflict by Father Dave on Nov 2nd, 2012. Comment. Peers,Have you noticed how interesting a good short story can be? Details can be especially interesting. Here’s a short story in progress that we can follow. A Palestinian man … accepted an invitation from a group of Jews … and all hell broke loose. The story would be funny if it weren’t so tragic. Thanks to the Christian Science Monitor for the commentary pasted below. Peers, let’s look on the bright side. An International Debate is in the process of precipitating, both in Cyberspace and on the ground. And under our very noses. I suggest that we pray that we deal with these matters with understanding. There’s a postscript. P.S. Peers, a heated debate need not be bitter. If we all start listening to one another with good will in our hearts … and … at the same time … if we all will respond honestly and without hesitation … (here comes the heard part) … we’ll all learn something. Please read on. Read what Hanan Ashwari had to say about the latest tempest in Israel’s tea pot. A Palestinian official prompted a heated debate when he visited Auschwitz last month. Many Palestinians believe that recognition of the Holocaust detracts from their own suffering. A rare gesture of empathy for victims of the Holocaust has underscored how divided Palestinians are over recognizing what Jews consider the darkest chapter in their history – and also how far apart Israelis and Palestinians remain, not only when it comes to the present conflict, but also the past. But Bandak is being backed up by moderate Palestinian leaders in the West Bank for what they say is a ”human” act. In the past, there was a sense among Palestinians that recognition of the Holocaust would detract from their own cause and suffering – an opinion accentuated by the feeling that their own struggles, including displacement by Israel‘s establishment in 1948 and the ongoing military occupation, have gone unrecognized by Israel and the international community. With his adviser’s visit to Auschwitz, Mr. Abbas has come full circle on the issue. In 1984, he published a book based on his doctoral thesis alleging that the Holocaust was exaggerated and that Zionists created ”the myth” that 6 million Jews were murdered. But when he became Palestinian Authority prime minister in 2003, Abbas wrote that the Holocaust was an unforgivable crime against the Jewish nation and humanity. He said that he wrote the book when the Palestinians were at war with Israel and would not have made such remarks today. But Ms. Ashrawi herself says she supports Bandak’s act, calling it a “human” gesture. “You can never discount suffering and empathy with the suffering of the other, regardless of whether he is Jewish, Christian, Muslim, or atheist. The Holocaust is a horrible chapter in human history. It should never be repeated, and should never happen to anybody, and an expression of empathy and recognition of the horror is only human,” she says. “I do not believe it will divert attention from the rights and agony of the Palestinian people. We do not deny the Holocaust or agree to any position that will try to minimize or justify the cruelty and barbarism embodied in the Holocaust,” he says. Tags: Holocaust, international debate, palestinian man. Filed under israel and palestine articles, israel and palestine religious conflict by Father Dave on Aug 12th, 2012. Comment.